Many thanks to Bob Gassel and Dennis Maierhofer, who has blown me away with his Bears History knowledge, for helping me out with details I did not know (and was not alive to see). I also thank Michelle Cunningham and Emily Kneusel for providing information on the Carroll College/Bear logo connection. Lastly, thanks also to John Munzenmaier for some information on when true road uniforms first appeared. 2012-In 2012 the Chicago Bears had their first uniform change since 2002, when the duds were totally revamped by Nike when they became the NFL's official uniform supplier. Official details on the new uniform are available on Nike's website. The major change is that the numbers on the jersey have been moved from the sleeve to the shoulder, giving the jersey an entirely different look. As of opening day 2012, the Bears have still not worn white pants on the road since opening day 2009. 2010- In 2010 the Chicago Bears wore an accurate throwback uniform for the first time since 1994. In celebrating the "Monsters of the Midway" era (1940-1946), the Bears wore a navy jersey with orange block numbers, white pants, and gray facemasks on a plain helmet. This combination was worn in home games against the rival Green Bay Packers and Minnesota Vikings, both Bears wins. Also notable this year was that again, the Bears continued the hated practice (here anyway) of wearing their away jersey in the home opener. They also wore navy pants in all games in which they wore white jerseys. And they donned a #99 sticker on their helmets to mourn the January 2010 death of defensive end Gaines Adams. 2008-For the first time since the 2003 season, the Bears wear white pants on the road exclusively. The orange alternate jerseys were worn on October 19th against Minnesota. And thankfully to this writer, the Bears abandon their 2005-2007 practice of wearing their road jersey and navy pants in their home opener. 2007-Absolutely nothing unique to report about the Bears' 2007 uniforms. They carried on two traditions I personally hate by opening the season in white at home against Kansas City for the third time in their history, then they wore the pumpkin orange jerseys also for the third time, against Detroit. The Bears wore navy pants on the road for all eight road games, as they did in 2004-2005 and 1984-1994/1996-1999. Like the rest of the NFL, they wore "21" stickers on their helmets after Redskins safety Sean Taylor was murdered. 2006-Once again the Bears open their home schedule against Detroit, and once again they defy a time-honored tradition by wearing white road uniforms at home. Also for the second year in a row, Chicago dons its "alternative" orange jerseys against San Francisco. A notable change is that the Bears wear their all-white road uniforms for the final two road games against St. Louis and Detroit. I like 'em. And who could forget-the Bears broke out their all-navy look for only the second time in history in the Sunday night finale against Green Bay. Given that the only other time they wore these were in another nationally-televised night flop against the Packers, I firmly believe we'll never see these again. Which I think is too bad, in my opinion they're pretty cool used sporadically. 2005 -Navy pants are again the uniform choice on the road; the Bears have now not worn all white on the road since 2003. The team pulls a shocker in their home opener, as they wear their road white uniform with navy pants at home for the first time since the 1940's. For shame. Also fairly shameful was the Bears' first unveiling of an official "alternate" uniform, featuring bright orange jerseys, against San Francisco in November. 2004-The Bears wear their navy road pants for all of their away games (except Thanksgiving) for the first time since 1999. Just days prior to their Thanksgiving game at Dallas, the Bears announce they will be wearing "1946" uniforms for the game as a part of the NFL's "Thanksgiving Throwbacks" day. Most teams announce their choice of uniform months in advance to celebrate the unique occasion, but the Bears do not announce or unveil until the week of the game. The uniforms featured an orange jersey of 1930's vintage with a white "C" on the helmet of 1960's vintage. Definitely not 1946 replicas as claimed. 2003-Team wears navy pants on the road during the preseason and the opener at San Francisco, then whites on the road for the rest of the season. Small shamrock sticker on helmets mourns the death of Ed McCaskey. 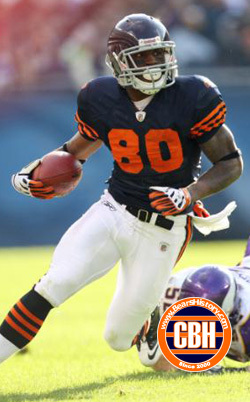 On Monday Night Football to open new Soldier Field, the Bears wear a commemorative patch that night only. 2002-White pants on the road exclusively. On Monday Night Football in Champaign against Green Bay, the team wears navy pants with their navy home uniforms for the first time in their history. Also, according to a 2006 article by the Chicago Tribune's Maria Mooshil, the NFL mandated the the Bears' blue to become slightly darker "to achieve standardization among teams." According to this article, the Bears share this shade of blue with Seattle, Buffalo and Houston, and it's called "Deep Obsidian". Pantone calls it "Blue Nights". Goodbye navy, huh? 2001-Team wears a "Salute to Solider Field" patch on their home uniforms all year. While wearing white pants on the road all year, the socks have changed in 2001 to the standard road socks usually worn with navy road pants (navy, orange, navy stripes). All NFL players again wear the American flag decal on their helmets. 2000-Black shoes make their triumphant return to the uniform during the first preseason game at the New York Giants, and still remain (through 2004). In a midseason surprise, the Bears switch to white pants on the road for the first time since 1995. They debut the look at Buffalo on November 12th. With the white pants they wear their home socks-three orange stripes bordered by navy. 1999-"34" patch is worn to mourn Walter Payton's death for the final eight games of the season. 1995-Bears wear white pants on the road for the final 2 away games. This is the first time the team has appeared in white pants on the road since 1983. With their white shoes, players look like ghosts. 1994-A replica of the 1920 uniform is worn against Green Bay, Minnesota and the New York Jets as a part of the NFL's 75th anniversary. At Detroit on October 23rd, for some reason Curtis Conway's arm numerals are on his shoulder pads instead of the sleeves. The NFL's 75th Anniversary patch is worn for all 18 regular season and playoff games this season. 1993-According to the Chicago Tribune, new coach Dave Wannstedt announces in February that the team will be wearing white shoes in 1993. 1992-A tribute patch is worn during the final three games to honor Mike Singletary, who is retiring following the season. 1991-A small football patch with the number "91" appears on the uniform for the final 2 regular season games and playoffs to mourn the death of rookie defensive tackle Fred Washington, killed in a car accident three days before Christmas. 1990-Bears become first team in many years to wear black shoes as a regular part of their uniform. The shoes remain until Dave Wannstedt's arrival in 1993. Only two other teams in the 1990's will wear black shoes: Indianapolis in 1994-1997 and Tampa, starting with their uniform redesign in 1997. In 2005 more than half the teams in the NFL will wear black shoes. In 1990, Bear receiver Glenn Kozlowski says he loves the black shoes. They make normal players look slower, he says, so in his case he believes they actually make him look faster. Also during this season, all NFL players wear an American flag decal on their helmets in support of US troops during Operation Desert Shield/Storm. 1984-A permanent change to the uniform is made with the addition of "GSH" to the left sleeve of home and road jerseys, celebrating the life of founder George S. Halas. On the road the team begins to wear navy pants with an orange stripe. The team wears this road uniform from 1984 until the last 2 road games of the 1995 season. 1983-After founder George S. Halas' death in October, the team wears a large football with the monogram "GHS" on their left chest. 1982-Facemask color changes from gray to navy blue. 1979-Team President George "Mugs" Halas, son of founder George S. Halas, dies tragically the morning of the Bears' season finale. The team wears a black armband the next week in the playoffs. 1971-1973-Sleeve stripes disappear from the home uniforms in 1971 and 1972. During certain, but not all, road games between '71 and '73, the white jerseys feature block numerals. In 1973, the white helmet "C" changes to orange with a white border. 1970-All NFL uniforms required to show player's last name on the back. As such, Bears do this for the first time. 1969-NFL's 50th anniversary logo patch worn on shoulder during the 1969 season. 1962-Plain blue helmet changes to include a white "wishbone" C that will become the Bears' logo. I have uncovered no documented evidence that proves the origin of this logo. Of course it's the same as the Cincinnati Reds', University of Chicago Maroons, and Carroll College Pioneers. According to this link from the Carroll College Library, the Bears may have "borrowed" the logo from that school during the 1940's. Until someone that was there at the time can comment, the jury is out as far as I'm concerned. 1950's-Chicago's unique rounded-font numbers appear for the first time at the end of the 1940's and remain with the uniform to this day. Standard uniform is a navy jersey with white numerals, bordered by orange, with orange stripes on the sleeves. In 1957 the true road uniform is introduced, and the team wears white jerseys and white pants on the road. 1940's-In the early part of the decade, the team wears white jerseys with navy pants. Numbers are of a block font through the latter part of the decade. Numbers are at times orange and other times white. Jersey is black during the early part of the decade. 1930's-It's probable the team wore five or more different uniform combinations during the decade. They included white jerseys with canvas pants, orange jerseys with navy pants, and radically striped socks, shoulders and helmets. Several photos from 1936 show the team with sleeve stripes, shoulder stripes, massive sock stripes, and helmet stripes like the University of Michigan. 1920's-When A.E. Staley directed Halas to move his football team to Chicago in 1921, he allowed the coach to take along the uniforms. They featured tan pants, navy or black jerseys with vertical canvas stripes sewn on. The canvas stripes' function was to help players hold on to the ball. From all photos I have seen, the team kept this uniform design throughout the 20's.